Whether you're after a galaxy far, far away or tales of sorcery, here are our recommendations of some of the best sci-fi and fantasy audiobooks. #LoveAudio week draws to a close today, so we thought we'd finish with a bang! In case you missed them, we've also listed recommendations for armchair detectives (crime), history buffs and picture books for children. 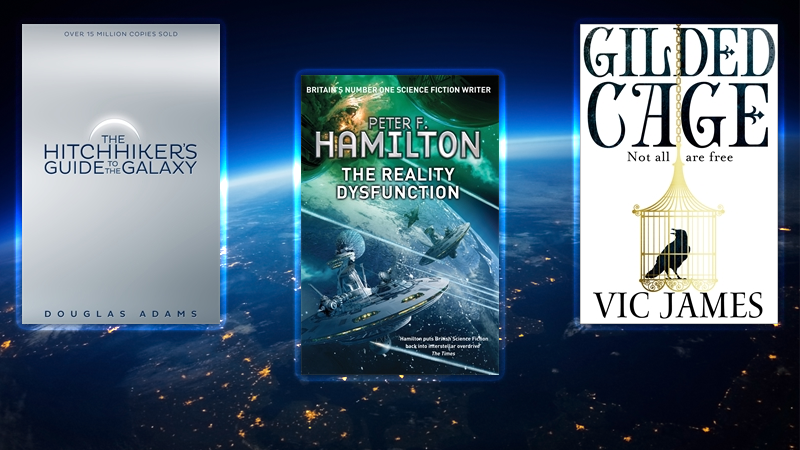 The Reality Dysfunction by Peter F. Hamilton is the first in a sweeping galactic trilogy from the master of space opera, The Night's Dawn trilogy. In AD 2600 the human race is finally realizing its full potential. Hundreds of colonized planets across the galaxy host a multitude of wildly diverse cultures. Genetic engineering has pushed evolution far beyond nature's boundaries, defeating disease and producing extraordinary spaceborn creatures. Huge fleets of sentient trader starships thrive on the wealth created by the industrialization of entire star systems. And throughout inhabited space the Confederation Navy keeps the peace. A true golden age is within our grasp. But now something has gone catastrophically wrong. On a primitive colony planet a renegade criminal's chance encounter with an utterly alien entity unleashes the most primal of all our fears. An extinct race which inhabited the galaxy aeons ago called it 'The Reality Dysfunction', and is the nightmare which has prowled beside us since the beginning of history. Britain's magically skilled aristocracy compels all commoners to serve them for ten years - and now it's the Hadleys' turn. Abi Hadley is assigned to England's most ruthless noble family. The secrets she uncovers could win her freedom - or break her heart. Her brother Luke is enslaved in a brutal factory town, where new friends' ideals might cost him everything. The Hitchhiker's Guide to the Galaxy has been a radio show, TV show, stage play, comic book and film, and is and a work of utter comic genius from Douglas Adams. One Thursday lunchtime the Earth gets unexpectedly demolished to make way for a new hyperspace bypass. It's the final straw for Arthur Dent, who has already had his house bulldozed that morning. But for Arthur, that is only the beginning . . . In the seconds before global obliteration, Arthur is plucked from the planet by his friend Ford Prefect - and together the pair venture out across the galaxy on the craziest, strangest road trip of all time. Agnieszka loves her village, set deep in a peaceful valley. But the nearby enchanted forest casts a shadow over her home. Many have been lost to the Wood and none return unchanged. The villagers depend on an ageless wizard, the Dragon, to protect them from the forest's dark magic. However, his help comes at a terrible price. One young village woman must serve him for ten years, leaving all they value behind. In AD 2329, humanity has colonised over four hundred planets, all of them interlinked by wormholes. With Earth at its centre, the Intersolar Commonwealth now occupies a sphere of space approximately four hundred light years across.When an astronomer on the outermost world of Gralmond, observes a star 2000 light years distant - and then a neighbouring one - vanish, it is time for the Commonwealth to discover what happened to them. For what if their disappearance indicates some kind of galactic conflict? Since a conventional wormhole cannot be used to reach these vanished stars, for the first time humans need to build a faster-than-light starship, the Second Chance. But it arrives to find each 'vanished' star encased in a giant force field -- and within one of them resides a massive alien civilisation. A thriller of a war that never was - of survival in an impossible city - of surreal cataclysm. In The Last Days of New Paris, China Miéville entwines true historical events and people with his daring, uniquely imaginative brand of fiction, reconfiguring history and art into something new. 1941. In the chaos of wartime Marseille, American engineer and occult disciple Jack Parsons stumbles onto a clandestine anti-Nazi group, including Surrealist theorist André Breton. In the strange games of dissident diplomats, exiled revolutionaries, and avant-garde artists, Parsons finds and channels hope. But what he unwittingly unleashes is the power of dreams and nightmares, changing the war and the world for ever. 1950. A lone Surrealist fighter, Thibaut, walks a new, hallucinogenic Paris, where Nazis and the Resistance are trapped in unending conflict, and the streets are stalked by living images and texts - and by the forces of Hell. To escape the city, Thibaut must join forces with Sam, an American photographer intent on recording the ruins, and make common cause with a powerful, enigmatic figure of chance and rebellion: the exquisite corpse. But Sam is being hunted. And new secrets will emerge that will test all their loyalties - to each other, to Paris old and new, and to reality itself. Sign up to our monthly newsletter below to receive the latest news, interviews and features straight from the Pan Mac team.